Martin was always a good teacher, if more by example than instruction. 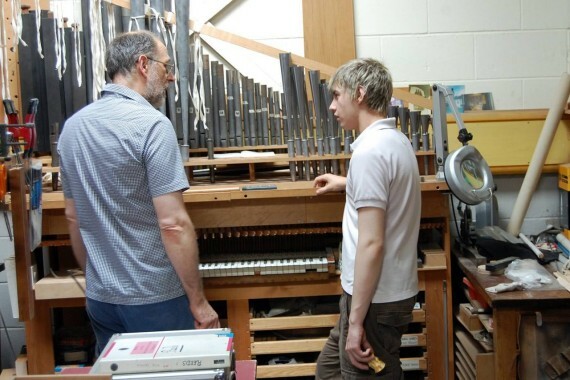 We have over the years since we were joined by Stuart Dobbs, straight from school, added to the organ building experience of over twenty young organ builders. A number of them came as journeymen was Germany and Switzerland, very well trained, but eager to absorb a new organ building tradition, and to learn techniques of restoration. Those from outside Germany were at various stages of development in their craftsmanship. We tried to work in pairs, with one of the partners accompanying the new craftsman or woman, not always possible or practical, but I think all would agree how much they learnt from him. Martin might not always have been available for an answer to a problem, but when it came it was always a model of precision and clarity. He usually preferred to demonstrate rather than deliver a verbal lesson. He taught most eloquently by working alongside people. I (Dominic) learnt more from him than anybody else – one just always had the feeling that Martin had found the best way to do something. Martin agreed to stand for the Board of the IBO (our professional organisation – the Institute of British Organbuilding) partly because he was becoming increasingly concerned about the loss of craft skills, especially in the skills required for classical organ building. When he was chosen to be President, he wanted to make a training programme one of the goals of his period of office. It would have been a challenging exercise in any case, but it was cruel that he had an accident and was diagnosed with cancer at the start of his second term. For that reason, Martin’s partner Margaret wanted to set up a fund to help young organ builders with their toolkit, to be awarded to the best young organ builder at what it is hoped will be a course in the School of Musical Instrument Making at Newark College. If readers wish to contribute, they should send payment via Goetze and Gwynn with cheques payable to “ Martin Goetze Memorial Fund”. As we all know, Martin was a wonderful craftsman and an equally good tutor. With his years of experience, calm nature and endless amounts of patience you couldn’t have wished for a better person to be taught by. However, I can bring to mind countless hours spent sweeping up around the workshop, sharpening tools and generally filling time, whilst Martin mulled over a question or problem I might have put to him. His normal practice was to wander off silently, scratching his beard. Needless to say, when he eventually returned it was always with a well-considered answer and a brilliant solution. Most of the time accompanied by an ingenious idea for some jig or tool to make for a better job, or to simplify the operation.